Unlike conventional saw teeth, which are filed, and alternately bent, the turbo-cut saw blade is taper ground and each tooth is honed to precise knife-edge sharpness. Fast, easy pull action is easier and safer than other saws. The shape of the turbo-cut blade is thinner at the top and thicker at the bottom-where the teeth are. 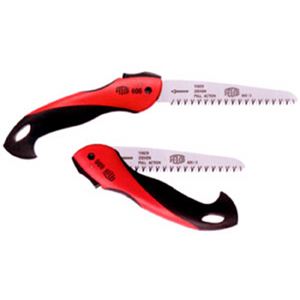 This unique Felco feature keeps only the teeth in contact with the material to be cut. This prevents clogging and binding, since the sides of the blade never come in contact with the wood. Blade length is 6 inches.